Reggie Wayne, who has spent 14 years of his career representing Indianapolis Colts, is going to sign a one-year deal with New England Patriots. This news was sourced to a report from ESPN’s Adam Schefter. In his illustrious 14 years, career with Indianapolis Colts Reggie had racked up 1,070 catches for 14,345 yards and 82 touchdowns. New England will be sorely missing the services of No. 2 wideout Brandon LaFell during the preseason as he was down with a foot injury. Taking out Julian Edelman, New England didn’t have a viable replacement for Brandon and, therefore, reached out to Reggie. Interestingly Wayne has played more games against the team he will represent in his career (16 including playoffs) than any other team other than Jaguars, Texans, Titans who share the AFC South with Colts. 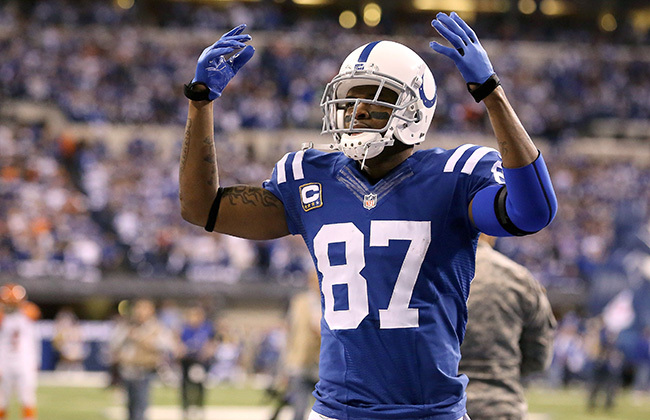 Of these 16 Wayne had taken 79 catches for 1,046 yards and five touchdowns as the Colts made a 5-11 record. In the Indianapolis’ AFC title game loss to New England way back in January, Wayne was catch less and received just two targets after catching five passes for 91 yards in the Colts’ Week 11 loss to the Pats. Wayne began his career with Indianapolis holding passes from Peyton Manning for a decade. There was a brief break with Curtis Painter-Dan Orlovsky–Kerry Collins trio during the year. He sat out after undergoing three neck surgeries. The next three seasons was spent with Andrew Luck as his quarterback. Wayne had suffered a Torn Anterior Cruciate Ligament and meniscus in a match against Manning and the Broncos two years ago. He was not the usual self in the last season and age was finally taking its toll as he fell off in 2014. New England will not be reckoning Wayne as their first or even second receiving choice. That job will be done by Rob Gronkowski, who will remain the No. 1 passing game target for Tom Brady while Julian Edelman in all probability will be the second option.